Dr. Mark Woodrey is a Research Ecologist at the Mississippi State University Coastal Research and Extension Center in Biloxi, Mississippi. He serves as the Research Coordinator at the NOAA/Mississippi Department of Marine Resources Grand Bay National Estuarine Research Reserve in Moss Point, Mississippi. 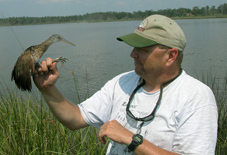 Mark has extensive background developing monitoring programs and conducting avian conservation biology research. In addition to his recent focus on marsh bird research, he has studied a variety of bird groups including intercontinental landbird migrants, winter forest birds, colonial beach-nesting birds, grassland birds, and breeding birds of bottomland hardwood forests. He now coordinates the Grand Bay NERR’s System-wide Monitoring Program; a national, standardized water quality and meteorological monitoring effort, and is involved in collaborative research projects focused on the ecology of estuarine fishes, effects of prescribed fire and sea level rise on coastal plant and animal communities, levels of mercury contamination in estuaries, and the nesting ecology of diamondback terrapins. The main goal of his research is to better understand the ecological relationships between the coastal flora and fauna to facilitate the informed and effective management and conservation of coastal ecosystems along the northern Gulf of Mexico.